Dōbutsu shōgi (Japanese: どうぶつしょうぎ "animal chess") is a small shogi variant for young children. It was invented by female professional shogi player Madoka Kitao (北尾まどか), partially to attract girls to the game. It is played on a 3x4 board and generally follows the rules of standard shogi, including drops, except that pieces can only move one square at a time, and with promoting the king as an additional way to win the game. The pieces are square, like children's blocks, have cartoon figures of the relevant animal rather than kanji to identify them, and often have dots on the sides and corners of the directions the pieces can move. The game has been marketed overseas as "Let's Catch the Lion!" Each moves as in standard shogi, but is limited to moving one square per turn. If the Chick advances two squares to reach the final rank (the "sky" for the player that started in the forest), it promotes to a Hen (tokin), which can move one square any way except diagonally backwards (like the gold general in shogi). As in shogi, if a Hen is captured, it may only be dropped back into play as a Chick. However, standard restrictions on where one may drop a Chick, such as not being allowed to give immediate checkmate, have two Chicks on a file, or drop the Chick on the final rank, do not apply. A chick dropped on the final rank, however, does not promote (and may make no further moves until it is recaptured). If the players play the same position three turns in a row, the game is a draw. Unlike in Shogi, perpetual check is also a draw. There are two ways to win the game: capturing ("catching") the opponent's Lion, and advancing one's own Lion into the promotion zone (farthest rank), as long as doing so does not place one's Lion in check. Dōbutsu shōgi has been strongly solved, meaning that the theoretical best move from each reachable position (there are 1,567,925,964 reachable positions in the game) of the game is known. White has a winning strategy from the starting position, although the theoretical win may take up to 78 plies (39 moves on each side). Thus, the game begins in a zugzwang position, in which the side to move (Black in the initial position) is at a disadvantage. By symmetry, the game also begins in a Trébuchet position, a full-point zugzwang position, in which the side to begin movement eventually loses. The best opening move (the one that delays loss the longest) for Black is to capture White's chick. In general, as with their long-ranged counterparts, the giraffe is stronger than the elephant. Like most small variants of shogi, particularly micro shogi and minishogi, having pieces in hand ready to drop is highly advantageous. The game does not lend itself well to handicap play, because a handicap of an elephant or a giraffe results in the handicap taker having a relatively easy forced mate. The variant of nana shogi shows that it is feasible to have a limited number of long-ranged pieces on such small-sized boards. A 9x9 version of this game known as "Dobutsu shogi in the Greenwood", which is identical to shogi, has been launched. 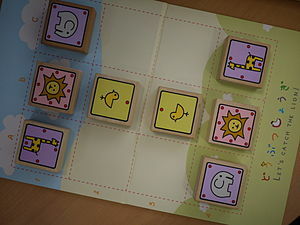 The game features new pieces and since the board is large, the movements of the Elephant and Giraffe (bishop and rook in shogi) are unlimited.